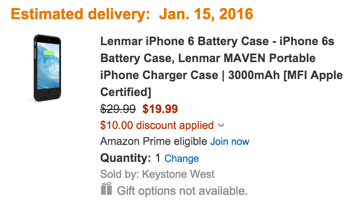 Keystone West via Amazon offers the Lenmar iPhone 6/s 3,000mAh Battery Case in Black, Red, Blue or Silver for $29.99, but if you use the code SDLENBC6 the price drops to $19.99 Prime shipped. That’s $10 off the regular sale price and the lowest we can find for it. It is MFI Apple Certified and has an integrated power button, LED indicator, rubber coating for grip, and raised edges for protection. It also comes with a 1 year manufacturer’s warranty. Amazon shoppers gave it 4.4/5 stars. Note: Make sure the seller is Keystone West for the coupon to work.